Your free testosterone levels determine how much testosterone your body has available for use. About 2% of testosterone is free in the blood at any given time. Whether you are a young adult, middle-aged, or in your golden years, you want to protect your free testosterone levels. This is crucial so that you have enough of this androgen hormone available for the body’s many physiological uses of testosterone. Doctors typically check total and free testosterone levels by age to assess testosterone deficiency. Measuring total testosterone lets your physician know if the problem exists in the hormone production cycle. When the testes or ovaries do not secrete enough of a supply of testosterone, supplementing with testosterone therapy might be the answer. When a person has normal levels of testosterone, the problem may lie in the separation of the testosterone from its encapsulation in SHBG. The connection here is tight, and if the testosterone cannot detach itself from SHBG when it arrives at the androgen receptor, testosterone cannot carry out its functions. Low free testosterone levels caused by this problem will require treatment. Another cause for reduced free testosterone is estrogen conversion. Adults with Low T tend to have increased abdominal fat. Belly fat produces the enzyme aromatase that rapidly seeks out free testosterone before converting it into estradiol. When this happens before testosterone can bind with its androgen receptors, testosterone functions cannot occur. The result is an increase in estrogen levels as testosterone declines. Estrogen dominance is the name given to the condition when too much testosterone undergoes estradiol conversion. Since estrogen also increases fat retention, you have a more considerable amount of aromatase entering the bloodstream to seek out an convert the free testosterone. The final reason for declining free testosterone levels is from conversion into dihydrotestosterone (DHT). The enzyme 5-alpha reductase also seeks out free serum testosterone in the blood for conversion into DHT. Elevated DHT levels can lead to female and male hair loss. Increased DHT can also cause prostate enlargement in males. Testosterone is an exceptionally vital hormone for women, just as it is for men. Granted, the ovaries do not produce anywhere near the amount of testosterone as the testes, but that makes its decline all the more dangerous. Women cannot afford to have Low T as their bodies are exceptionally sensitive to a decrease in testosterone levles. Even the slightest change can cause symptoms of low testosterone to appear. 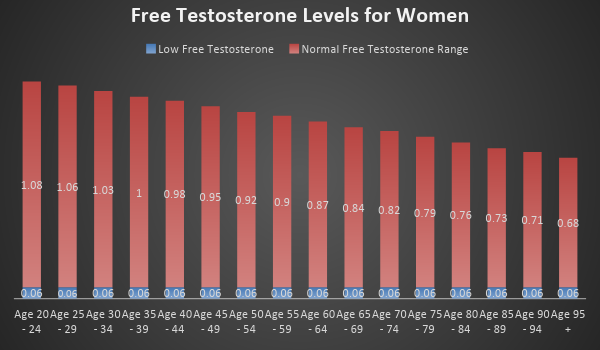 The free testosterone levels female chart below shows how age affects the amount of available testosterone the body has for use. Although hormone production dramatically declines during menopause, a woman’s adrenal glands will continue to provide some testosterone. A healthy free testosterone levels average range would fall somewhere in the upper half of the pink bars. If you get too close down to 0.06 ng/dL near the blue zone, it is likely that you will experience signs of Low T.
While the charts may look similar, check out the difference in the numbers. 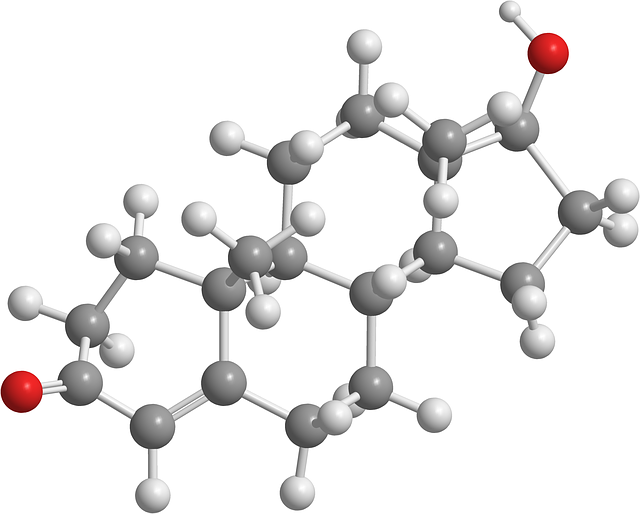 A man between 50 and 54 years of age could have as much as 15.6 ng/dL of free testosterone. When you compare that to a woman who has only 0.92 ng/dL, you can clearly see the difference. Maintaining healthy testosterone levels in males is vital for the body in many ways. Testosterone helps keep your metabolism functioning properly so that you have plenty of energy without storing unwanted fat. You need testosterone for proper brain functions, sharp memory, and emotional well-being. Low testosterone levels can interfere with sleep, mood, focus, and even libido. 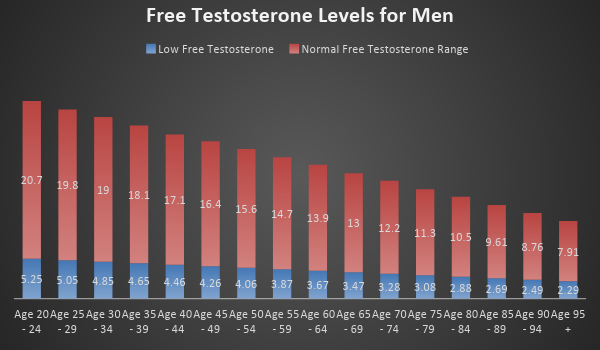 In the free testosterone levels chart below, you will see how much free testosterone your body should have depending on how old you are. The closer you get to the blue range, the greater the chance that you will experience Low T symptoms. Men with blood test results at the bottom of the free testosterone levels red zone may also experience symptoms of low testosterone. Hormone doctors look at more than just blood test results when diagnosing Low T. Some men with numbers much lower than the blue zone may not have any low testosterone symptoms. They would not require treatment. The body is designed to adjust to declining hormone levels. It is only when symptoms of that decline become evident that treatment is necessary. That is also why many men with “low-normal” readings do have symptoms that require testosterone replacement therapy. There are several choices for improving testosterone levels dependent on the cause. Of course, this is a subject you should always discuss with a hormone specialist. You will require comprehensive blood testing to see your testosterone levels and determine the cause of any decline. If your total testosterone is normal but free testosterone is low, the question becomes whether one of the two enzymes is converting too much testosterone into estradiol or DHT. If so, then an enzyme blocker may be all that is required to boost free testosterone levels. However, if you do have low total testosterone, then supplementing with testosterone replacement therapy can boost your levels. Some men may also benefit from HCG injections which can help promote testosterone secretion. Your doctor will also measure FSH (follicle-stimulating hormone) and LH (luteinizing hormone) to see if they are the cause of your Low T.
How Does A Proper Sleep Routine Help You Stay Young?